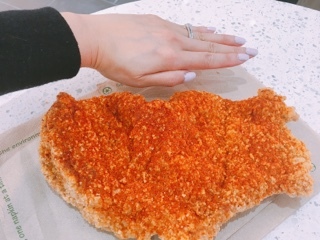 After the success of their downtown location, Hot Star Large Fried Chicken has opened a North York outpost so patrons in North Toronto can also enjoy their larger-than-life chicken. Lucky for me, during their August soft launch period, the store was relatively quiet for weekday lunch – finally, I could try the item people wait painfully in line for. 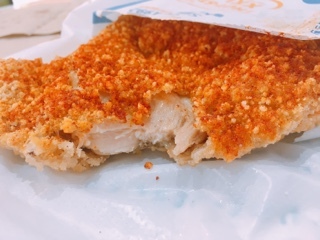 Some describe the large chicken cutlet as Taiwanese schnitzel, but it’s an inaccurate description. 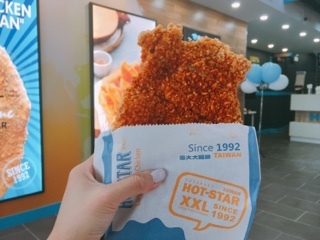 Firstly, Hot Star’s is much thicker - about half an inch wide while traditional schnitzel should be as thin as cardboard. 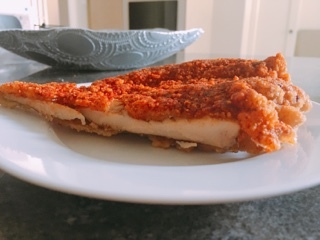 Moreover, the breast bone remains connected at the bottom of the piece (hard to decipher at first since it is battered), while schnitzel is boneless. However, true to other descriptions, it is as large as your face and does arrive piping hot as they’re made-to-order…taking about seven minutes for me. For my first taste, I tried the original large fried chicken with extra spicy seasoning ($9.99). In reality, the flavouring is just chili powder sprinkled on top and even with the extra spicy it’s a manageable amount of heat that slowly builds with subsequent bites. 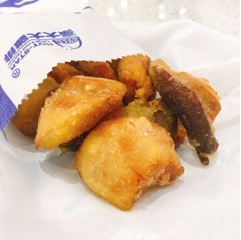 Aside from having it plain, customers can also flavour it with salt and pepper, seaweed, plum or curry. For an extra 50 cents, there’s a wet version drizzled with barbeque sauce - a good option for those who like katsu. It’s really large: enough to share (just be careful splitting it in half given the bottom portion does have the aforementioned bone) or saved for another meal (mine re-heated nicely in the toaster oven becoming crispier and less oily). Despite the size, I had to try the fried king oyster mushrooms ($4.99), which were delicious - just try resist biting into them as soon as they arrive. They’re really hot and after patiently waiting several minutes for them to cool, you can pop the entire nugget into your mouth, so a flood of crunch and sweetness is released in all its glory. Normally, a fried chicken and drink combo is an additional $3.50. During August 25-27, 2017, the North York location is giving customers who purchase a large chicken cutlet, a blue curacao or green apple yoghurt drink for free. Head over soon before the lines start forming… once someone sees you holding the massive chicken slice, they’ll want one too. Disclaimer: The large fried chicken was complimentary. Rest assured, as noted in my mission statement, I will always provide an honest opinion.